Asphalt Oxidation begins as soon as asphalt is laid. Exposure to oxygen is problematic in that it triggers molecular processes in asphalt that create new polar sites, or “bonding sites.” The spike in polar sites permits molecules to move around, seeking bonds that help them reach a stable thermodynamic state. This push toward equilibrium continues as time progresses, causing the asphalt molecules to connect with asphalt aggregate. The pavement stiffens and becomes brittle as time progresses. Stiff pavement is prone to cracking and other forms of damage that require costly repairs and eventual replacement. What Influences the Oxidation Rate? A number of variables impact the rate at which this occurs. Everything from the temperature to time and exposure to oxygen affects the oxidation rate. Each of these factors is directly related to the rate in that the rate increases right along with the variables. 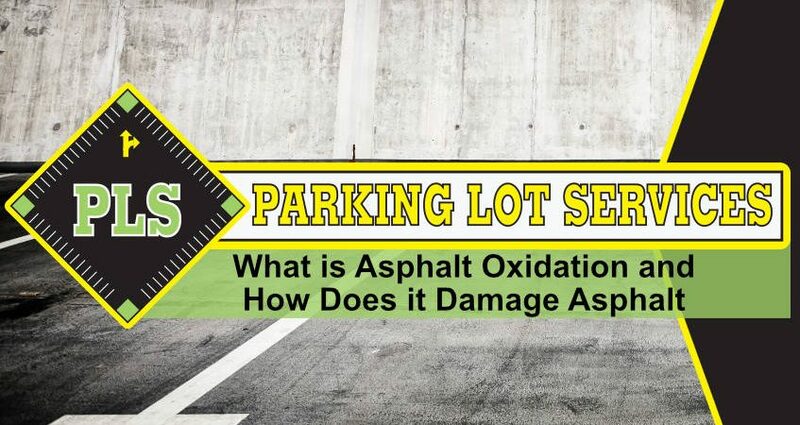 Every property owner should make an effort to understand the basics of asphalt oxidation. It is a direct threat to the integrity of asphalt parking lots and other asphalt spaces. Asphalt oxidation gradually causes asphalt to become brittle, less elastic and more likely to crack or fail in another manner. In fact, this process can be documented across a series of years as the pavement’s color gradually changes. Brand new asphalt pavement has a dark black hue. As this occurs, asphalt becomes a lighter shade of black, eventually morphing into a black-grey hue. Cracks form in this process, fatigue settles in and failure is inevitable. This is the main reason most parking lot lifespans are two to three decades. Once the asphalt oxidation process stiffens the pavement, the asphalt load-bearing capability decreases, causing asphalt fatigue, cracks, and subsequent failure. Asphalt failure rate skyrockets after the asphalt have oxidized. If you spot any issues in your pavement, contact a professional asphalt patching and repair service. If you take proactive measures, it is possible to reduce the rate at which your asphalt pavement oxidizes. Abide by a regular schedule of sealcoating. Your parking lot should be sealcoated at least once every year or two. Sealcoating significantly reduces the oxidation rate if installed in the first years after the pavement is placed. If your asphalt pavement has oxidized, sealcoating will prove ineffective as elasticity will have significantly diminished. Prolonged elasticity is essential for crack and pothole prevention. If your asphalt pavement has oxidated take action by contacting the experts for help. PLS will assess your asphalt surface, develop a plan of action, and perform the appropriate maintenance, repair, or replacement to restore your asphalt. We will even plan for asphalt sealcoating in Tampa. Contact PLS at (813) 880-9100 to learn more about asphalt oxidation and our asphalt paving services. You can also schedule a no-cost consultation.